An Accessories Guide For Kids Scooters. Here is a recap of our top accessories! 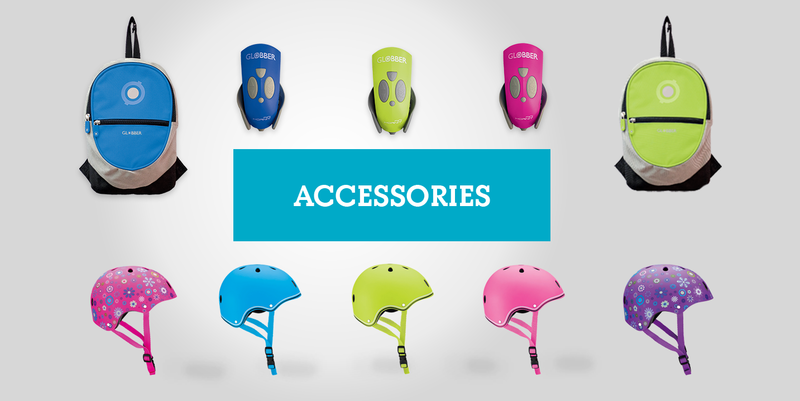 Whether you need protective gear, light-up scooter wheels, scooter headlight, scooter bells, scooter helmets or kids’ backpacks, we’ve got you covered! It’s essential for all scooter riders to wear helmets and protective gear including our extra-padded elbow and knee pads. To find out which helmet size is best for your child, take a tape measure around the circumference and largest part of the head. Our helmets come in a range of colours (blue, green, red, pink, purple, and black scooter helmets), patterns and sizes. What’s unique is our kids’ helmets come with an adjustable ring to further help perfect the fit. Fancy keeping your kid entertained for hours with our light-up scooter wheels? The faster they ride, the brighter the wheels flash! You can upgrade your 3-wheel scooters to our light-up scooter wheels for the front & back wheels. The wheels flash in blue, green & red, and are battery-free thanks to our dynamo lighting integrated in the wheels’ core. Our Mini Hornit is a scooter bell and scooter headlight all-in-one! It comes with 25 different scooter bell sounds to choose & 2 LED lights. With the adjustable silicon straps, it’s easy to attach to scooters. Have fun accessorizing your kid’s 3-wheel scooter with our scooter friends; Dino or Unicorn! Dino scooter friends are available in green and blue, and Unicorn scooter friends come in pink and purple! Our scooter friends make a cute and fun companion to your little one’s rides and are made from quality, durable material to go the distance on any child’s adventure! They are super easy to fit onto our Globber scooters & popular 3-wheel scooter models. Copyright © 2019 Globber. All right reserved.